Why choose an "exam visit" instead of a "vaccine clinic" visit? A vaccine clinic visit does not typically include a veterinary exam and time to ask the veterinarian questions about vaccines, parasite control, diet, behavior, how to prevent illness and how to keep your pet in optimal health. Because pets cannot tell you if they are in discomfort, it is important they are thoroughly examined once or twice a year by a veterinarian. 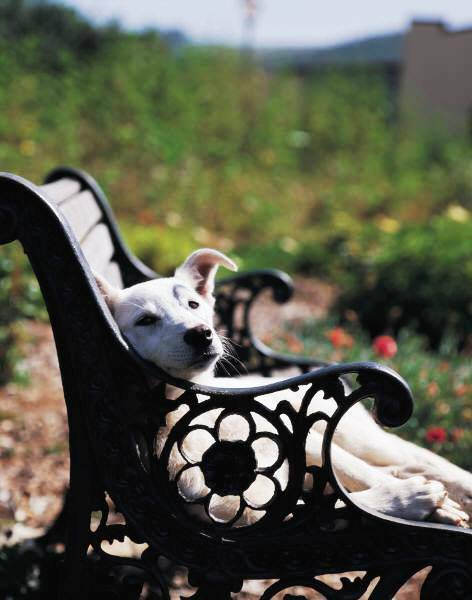 What can pet owners do to reduce the stress of a veterinary visit? Some pets are somewhat fearful by nature or become stressed by veterinary visits. The most common symptoms are hiding, trembling, vocalization, or aggression. To ease any negative emotional effects of nail trims or other minor procedures that may not be very painful but seem very stressful to this individual pet, the pet owner can request mild sedation for an additional fee. One goal of mild sedation or tranquilization is so that the pet only remembers positive experiences at the veterinary practice. 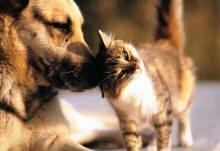 Take these steps for EVERY dog and cat visit to the veterinary practice. 1. Withhold food for 12 - 24 hours prior to the veterinary visit. Put together a bag of special treats (small pieces of meat, cheese, or any other tasty item NOT given at home). 2. Give the first treat when getting in the car to go to the veterinary practice, the second in the parking lot of the practice, third as your go in the door, fourth in the lobby, fifth on the scale or exam table. Ask the veterinary staff to give your pet treats. Act jolly and relaxed. Your pet reads your body language and takes cues from your emotions. 3. 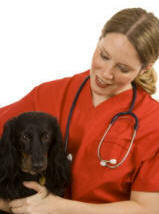 When the veterinarian enters the room, ask he or she to give your pet a treat. For puppies and dogs, it is even better if the veterinarian and staff ask your pet to sit, and then offer the treat. If your pet is trained, use any waiting time to practice commands. Make this a fun, interactive time for your pet. 4. Use treats to distract the pet from injections and minor procedures. Again, act relaxed. Your pet may interpret soothing as confirmation of fear. Petting and soothing a fearful pet often reinforces the fearful behavior. Bring a string to chase or make a cheese whiz line on the exam table to help distract your cat. Or, make a cat burrito using a fluffy towel from home with your scent on it. 5. Bring cats in portable kennels or pillow cases. Cats like a place to hide. If your cat will need to stay for a procedure, bring a brown grocery bag and request that the bag be put in the kennel BEFORE the cat. Being able to hide lowers the cat's stress immediately. 6. For dogs that tend to bark, distract with treats and prevent eye contact with other pets. If you can, walk the dog briskly outside securely on leash, offering treats for frequent sits to release some of the energy or tension. With a little extra effort, you can provide your pet with a kinder, gentler veterinary and home experience. Help your pet to see the veterinary practice as the "cookie place" not a "chamber of horrors". See pets drag people in - not out - your door!